Mural in Upper Verde Justice Court Room by the late Randolph Pyne, entitled: "Explaining the Law". The mural was conceived, designed and executed by Mr. Pyne. Ray Manley, friend and fellow artist of Mr. Pyne completed the work by applying the protective coats. COTTONWOOD, in North Central Yavapai County is the most important community in the famed and colorful Verde Valley, land of flowing streams teeming with game fish, lush farms, green and productive under irrigation and thousands of healthy beef cattle and their equality important cousins the dairy cows; land of the red rocks, familiar to movie goers all over the world; land of great copper mines, now depleted; land of the nasal twang of New England is heard in friendly discussion with the liquid music of Spanish, the guttural accent of Yavapai and Apache as well as the more common lazy sounding but alert drawl of the Southwest. Here is the land of the friendly hand and the kindly word. In the Verde Valley area you will find Jerome, the liveliest “ghost city” in America within 30 miles of Sedona in the Oak Creek Canyon country, mecca of artists and lovers of natural beauty growing and expanding in a most spectacular manner. Here too, lies Camp Verde, site of Fort Lincoln during the war between the states; Clarkdale site of the new cement plant, construction of which is about to begin; Cornville, Rim Rock, McGuireville, Smelter City, Clemenceau and Bridgeport, sparkling little gems in this fabulous setting. Law enforcement is not as great a problem in this area as it is in most places but there are so many hundreds of square miles in the valley that there are three deputy sheriffs in the area. R. M. Robbins covers the Clarkdale area and often assists in the other parts of the district. A former sheriff of Yavapai County “Bob” is as respected and loved as he is well known as efficient and capable law enforcement with the “savvy” that years of experience bring. “Tuffy” Peach takes care of the Camp Verde country. He too, is an experienced law enforcement officer and does a job and does a job that is more than satisfactory to the citizens of the area. Mr. Allan Smith, is an addition to his official duties, active in the community affairs of Cottonwood, the town to which he is assigned. He is Civilian Defense Chief for the Verde Valley and in addition operates a business in Cottonwood, with the aid and assistance of his wife. Paris Webb a constable of the Upper Verde Precinct is the other law man in Cottonwood. Covering the area at night he is unfailing in his duties by storm, or sleet or snow or cold or heat. Nor can he be deterred in any way from doing his sworn duty. Magistrate of the Upper Verde Precinct, which covers the valley, except for the small precinct of Camp Verde and Jerome, is Justice of the Peace, Terry Finnegan, who during his term of office he acquired a reputation for understanding and sympathy as well as sternness for the flagrant or consistent violator. Judge Finnegan has been heard to express pleasure over the fact that his part of the Verde Valley is widely known as a place to be avoided by drunken drivers. His time is in demand as an arbiter of domestic difficulties and many couples have found his counsel helpful. He has deep interests in the problem of juveniles and has the confidence of many of the younger citizens who have had some difficulty with the law. The tribal council of the Yavapai-Apache Indian Reservation of Camp Verde and Middle and have sufficient faith in his fairness and integrity to appoint him the judge of their tribal court, with full jurisdiction in all matters , civil and criminal, not governed by Federal Courts. The County Building at the foot of Main Street is a stone structure in which is found the Upper Verde Justice Court, as well as the office of Deputy Sheriff Smith and the local jail. Citizens of Cottonwood and the whole area, as a matter of fact, take great pride in the mural upon the north wall of the court room. The last major work of Clyde Randolph Pyne, well known landscape artist, is said by the Verde people to be the only mural painted on the wall of a Court of Justice, presided over by a Justice of the Peace, painted by a recognized artist, in his prime as a gift to his fellow citizens. 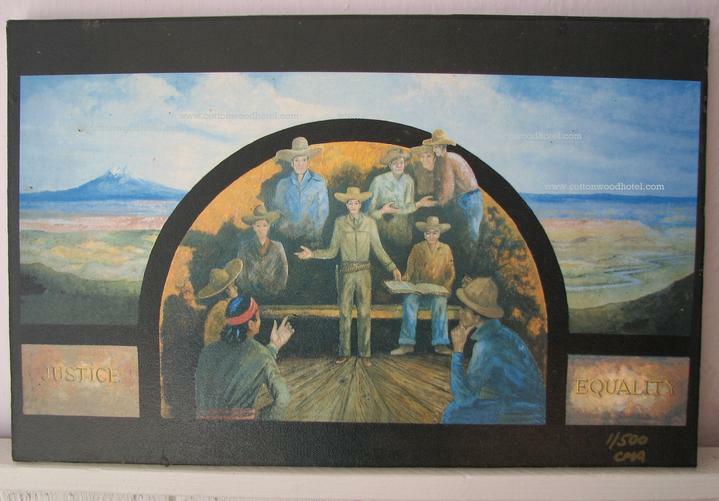 The mural consist of a central panel, enclosed within a Roman Arch, depicting an old time J. P. explaining the law to a group representing the citizens of the Verde Valley- Indians, Mexicans, miners, ranchers and farmers as well as towns people. The J. P. wearing a cartridge belt and holstered pistol, points to an open volume, held by a court attaché, as he seems to drive home his point with a right hand gesture. The left and the right panels are a panoramic view of the Verde Valley as seen from Mingus Mountain, with the San Francisco Peaks to the north and left, extending southward to the right panel in the vicinity of Bridgeport, with the meandering Verde River in the foreground. Sugar Loaf Hill, then twin Mesas with the Red Rocks fading into the distant blue horizon. After the mural had been completed, the boys of the Cottonwood High School having heard that there would be a wide interest in the mural, prepared a sign in native ponderosa pine in a rustic natural finish, as a community project. With black and green lettering the sign, measuring eight feet by eighteen inches, improves the heretofore mentioned somber looking building and has caused considerable comment. All the Deputies and Constable work together as a well co-ordinated machine-efficient and capable, being at the same time human and understanding. At the present time there is no Highway Patrolman assigned to the area, T. E. Shartzer formerly stationed here having been advanced to a lieutenancy and transferred to the Flagstaff area. The people of Cottonwood are to be congratulated upon the personnel in law enforcement in their area. If a “mistake of the head” is sometimes made, to how many “mistakes of the heart” can the most critical point? NOTE: In 1997 the mural was rediscovered by Main Street Project manager, Phineas Walsh and restored by Dennis Renner. Another great piece of Cottonwood, Arizona history!